Having play areas for multiple dogs tends to put a lot of wear and tear on natural sod lawns, leading to discoloration, bare patches, and muddy areas in the grass. This can be frustrating, especially to owners of pet care facilities. That is why more and more customers are making the switch to onelawn® synthetic pet turf. 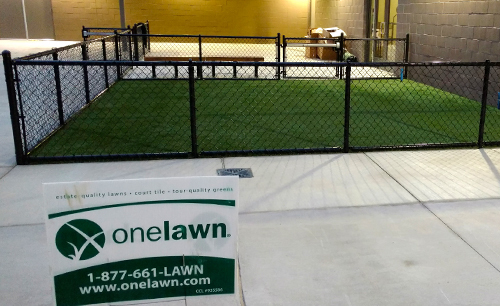 onelawn® synthetic pet turf stands up to heavy pet traffic and prevents dogs from digging. Cleanup is also much easier with our synthetic turf surface. Pet waste will no longer leave discolored patches in your grass and can be cleaned off with a hose or a common anti-bacterial spray if needed. Because onelawn® is antimicrobial, pet odors will not linger once the grass has been rinsed with water. Pet urine will easily drain through onelawn® – even better than natural grass. Our synthetic pet turf surfaces are exceptionally durable, comfortable for play and keep pets clean, which is why our lawns are perfect for pet care facilities, dog runs, pet areas, and dog parks. Integrated TruFlo backing allows liquids to flow through at rates over 400 inches per hour. That’s the highest drainage rates available. Installing the tile layer provides drainage features not available with other artificial grass systems. With this 3/4” lift under the turf, liquid can drain away quickly and completely. The drain tile provides airflow under the turf and a cleaner drainage path for waste and flushing. Envirofill is a non-toxic, non-flammable infill that stays cooler and lasts longer than other infill materials. Infused with Microban® antimicrobial technology, Envirofill inhibits the growth of bacteria, mold and mildew that can cause stains, odors, and product deterioration. The base layer is constructed with clean aggregate base that offers lower costs and maximum drainage. XGrass Pet Solutions can also be installed over an existing concrete or asphalt surface with proper pitch and drainage. © 2019 onelawn All rights reserved.